Large bedrooms, pool table, and fenced backyard within walking distance to everything. Coeur d'Alene Place is one of our Signature Series homes in a dream downtown location. You’ll find yourself within easy walking distance to Coeur d’Alene’s public beaches, parks, shopping, dining, and entertainment. Whether you’re taking a stroll around the boardwalk, hiking on Tubbs Hill, or watching the kids play at Fort Sherman Playground or splash on the splash pad at McEuen Park, you’ll love that you can get around without a vehicle. This pristine home has been gorgeously remodeled and features stunning modern decor throughout. The welcoming living room creates a cozy space to relax and watch TV while you enjoy the light streaming in through the windows. In addition to the main living room, there’s also a fabulous entertainment room with a pool table, seating, and a beautiful fireplace filled with candles. You’ll enjoy preparing meals in the fully stocked kitchen equipped with upgraded appliances and granite countertops. The nearby dining area seats 6 at a sturdy wooden table and views of the fantastic landscaping in the backyard can be seen through the sliding glass door. This home also offers a laundry area with plenty of space to hang dry your bathing suits. The decadent master suite has a king bed and an attached bathroom with double sinks and a gorgeous shower. Everyone can stretch out on the queen beds found in the home’s other 3 luxurious bedrooms. There are also 2 additional full bathrooms—1 with a glass shower and 1 with a shower/tub combo. When you’re not out exploring Coeur d’Alene, you can gather in the large fully fenced backyard. This area is complete with outdoor seating, a BBQ, covered table, fire pit, and more than enough room for the kids—and/or pets—to run around. 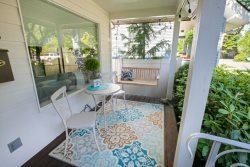 Guests of all ages will enjoy the luxury and location of this downtown Coeur d’Alene vacation rental. I did not have to ask for help from anyone other than to check in. Everything was great except there was no dish soap which made cleaning difficult. There was plenty of room for everyone! The house was very clean and comfortable. Loved the fact the that the television was easy to use. Everything was very easy and people were very responsive to questions. This is a very nice place in a great location. No problem - everyone helpful and friendly. Everyone was great. The house was absolutely beautiful and the perfect location. The home was beautiful, well-appointed, and well taken care of. It was the perfect spot for my family. It felt like home and was well taken care of. I did appreciate the quick response to my request to book the house for the weekend. I did have to email to request the information of where the house was located before we left home and then had to double check to confirm the dates we had booked for. We enjoyed our stay at this property. It is spacious, convenient location. Nice size back yard. It probably would have been different if we had been there in the summer, the garden looked in need of care. Rob was fantastic and very accommodating. 4 families decided to rent one house in Couer d'Alene for vacation. On Saturday, our plan was to rent a pontoon and spend the day at Hayden Lake. Rob called us was very kind and understanding. He went out of his way to make sure we were able to pick up our pontoon. Our party of 8 adults, 8 children had an amazing time on Hayden Lake. Many of the members in our party stated that this was "the best vacation ever." As a side note, all of us at the rental property are physicians. We often travel extensively together. The fact that Coeur d'Alene left such a positive impression on all of us, is partly a testament to the great service we received from your company. Kudos to all! Managers Note: Thank you so much for the kind words. We were happy to assist with the pontoon boat and we are thrilled your party had such a wonderful time. We truly love Coeur d'Alene and we are always happy to share our beautiful town with visitors. We will be back next year. My wife and I often vacation at least once a year with her sister and their family. This year, we vacationed with friends. Next year, we will bring the extended family, and hopefully turn this into an annual tradition. I appreciate that when we were deciding upon the property that Cheryl drove out to the property to let me know if there was a patio seat and how many it seated, she also sent a picture they took with their cell phone. What a great help and it sealed the deal. She has great customer service skills. Loved it! The place was very clean and nice and suited our needs perfectly. Lovely back yard. Hope to be back again next year.